Went shopping in London on Saturday just gone with the idea of meeting up with Fred later on in the day. First stop Westfield. Westfield is good as you can park the car all day for £9 on a Saturday. Think I went into all the shoe shops and most of the department shops. Had a good look around next. Biggest problem I have is that I'm size 9. Next don't always put size 9 out and trying to find a shoe that fits is hard. New look is better but didn't find anything I liked. I don't try on heels unless I intend to buy them. I had finished doing my shopping here and a bite to eat. Still waiting for Fred to turn up. I made to move to go into Camden Town. There is an Aldo clearance shop there. It gets very busy here and I found some knee high and thigh high boots I liked just not in my size. In hindsight I should of gone to Oxford street and do a little shopping there while waiting for Fred. Fred did turn up around 5pm. We had a quick cup of tea and went back shoe shopping. I found a nice pair of heels and that fitted but I must really like them for me to buy heels now. I had to leave Fred and his friend around 8pm yet I wanted to visit more shoe shops. As it turned out, yesterday wasn't the best day to travel (at the times I travelled anyway). Had worked until 10pm the night before, getting home the wrong side of midnight. Time I got washed and fed, it was the early hours. Tired, I struggled to get up as early as planned. Had to collect my walking partner from her relatives, where she'd spent Christmas. Traffic was quite bad either way, and arriving at lunchtime, I was further delayed by the family lunch. While I'd kept Heels fully informed of my travels and delays, it didn't help recover lost time. The last mile into the West End, took almost as much time as the rest of the journey, and parking ..... A further 35 minutes. Again, Heels was kept informed by text message all the way (with what seemed like 10 minute updates during the last hour), but it didn't help reduce the journey time. We arrived much, much later than originally planned. My apologies to Heels for that! Hopefully the pot of tea helped? Zara had lots in the sale, but knocking £20 off a £100 pair of shoes (or even £30), wasn't going to sway me. Certainly reducing a £40 pair by £10 wasn't likely to. Eventually tried on, and bought some ankle boots from the Topshop concession. (See elsewhere.) I expect they will have to go back, but at least I don't have to go to London to return them. Lovely boot, but maybe a tad small for me. We then went to Debenhams. More shoes, but nothing of interest to me. Heels tried on some open toe 'sling-backs', but couldn't decide whether to buy..... But wishing he had of, later on. I got spotted by some 'macho' male (ethnic) shop assistants working in the girls shoe section, who were seemingly amused at my heels? (Oh the irony.) I was tempted to get one of them to fetch some heels for me to try on (playing to the audience) but I was much much too hot (and annoyed) to wind them up further. About this time, my walking pal decided she'd had enough of shoes, so we had to call the shopping bit to a close at 8pm. We said our goodbyes and went our separate ways. We did pop back into Zara while returning to the parked car, and I got to try on the £40 ankle boots reduced to £30. Fit was okay, but the £60 Topshop boots (very similar style) were significantly nicer, so no purchase made. Car journey back, took less than half the inbound journey time! On balance, the trouble of travelling in by car - despite the freedom it usually affords - just wasn't worth it. Worse, the range and value expected in the Winter sales, just weren't there. I had been tempted to return again the next day, with more time available, but decided it just wasn't worth it. 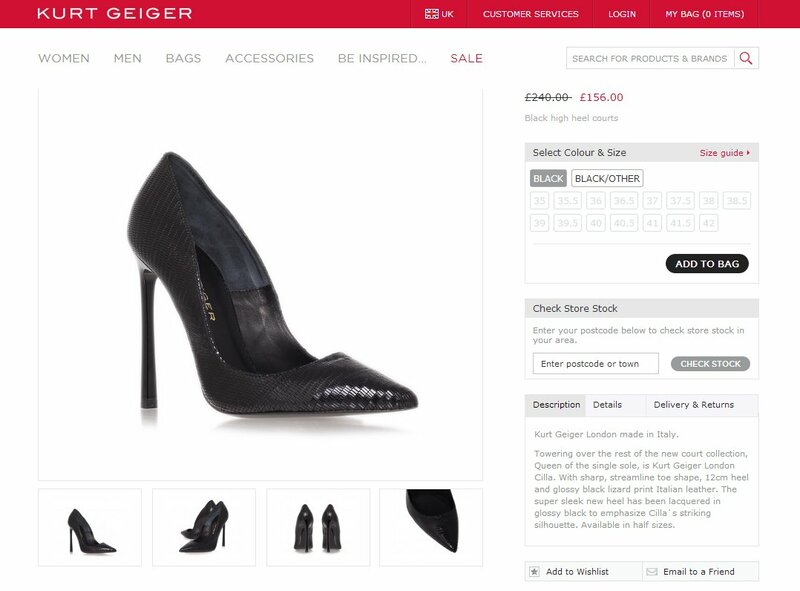 Found the style name, and then a piccy on the KG web site. Seems 'out-of-stock' items don't get found on their site search? Anyway, this is the style I tried, in a 41. Then found a bookmark for the shoe at Selfridges ..... That's a high heel. While 'doing' the winter (shoe) sales, I stumbled across the KG Cilla at £75, and in my size. At the time, I was returning 3 pairs in other styles to recover the cash invested. As I'd arrived at the West End late, I only managed to return 2 of the 4 items I was taking back before 90% of the stores closed, leaving me with 2 pairs still to return and only £68 recovered. The store with the KG shoes was one of those that had closed. With almost all the stores closing at 9pm I started to make my way back to my car. Noticing that a large Office store still had its door open, I popped in and left fairly quickly, before I was asked to leave. [Zara are good at this, giving shoppers an extra 5 minutes before they shut.] As I was leaving the Office store I noticed the store Opening Times stuck to the front door, and as they shut at 10pm, I went back in. It hasn't stopped me asking in stores though. Seen as a probable complete-waste-of-time, it hadn't stopped the optimist in me enquiring. So while I was in the store, and while I couldn't get at the KG Cilla (to make a decision I'd probably regret whatever I did about them), I asked about a black leather pair of On Top in an 8 (41). They had a pair! £68 recovered - £65 spent. Hopeless! Having written about my new purchase, decided to try them on and strut about in them for a short while. Walking around, have found the left shoe squeaks! 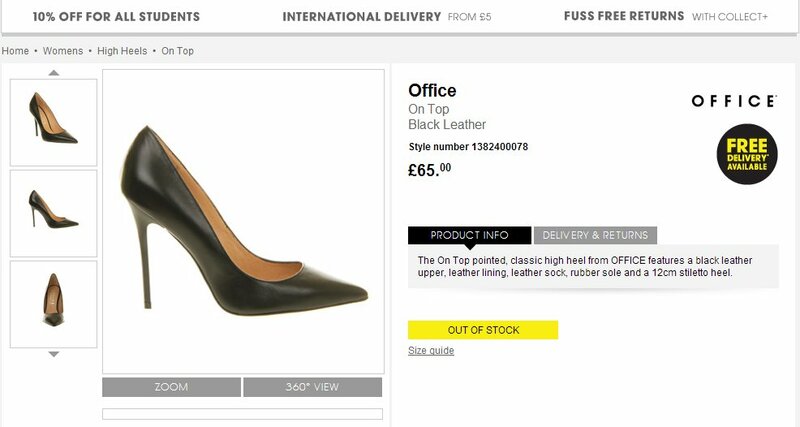 Explains why there was a pair left in a busy London store. I'd noticed 3 sets of numbers hand written on the shoe box. This is the type of mark ALDO staff apply I believe, to ensure they get their commission (if there is any). Looks like these shoes had at least two previous owners then? Not sure what I'll do, but looks likely they'll be going back. I think in future I would go back to the west end when its not so busy. For me going to store after store trying to find size 9 heels is almost a waste of time. Having to keep asking sale persons if they have that heel in a size 9 gets annoying. I have now bought the pair I tried on in Debenhams. Bought them by Debenhams online and are cheaper then before. Just have to go to Portsmouth but can have a look around the shops at the same time. I can easily understand that fruitless trawling for suitable shoes that fit, wouldn't seem like a good use of time. But my time in the West End isn't just for finding new footwear. As anyone who has met me will know, I'm seldom away from home without a heel on. The late afternoon/evening out meant I got to wear heels doing something I like doing; looking through the sale racks for 'bargain priced' shoes, and meeting someone I hadn't seen for a while of course. I have a method for this sort of shopping. Toward late Autumn I have a good look at the recently released styles, and decide which I'd like to own. Not always, but often, I'll try to establish which will provide a suitable fit. By the time the December/January sales arrive, I already know what the better prices are, and who might still have stock left. If I were looking to be as efficient or as effective as possible in my purchasing, I'd simply order everything I could afford from home. 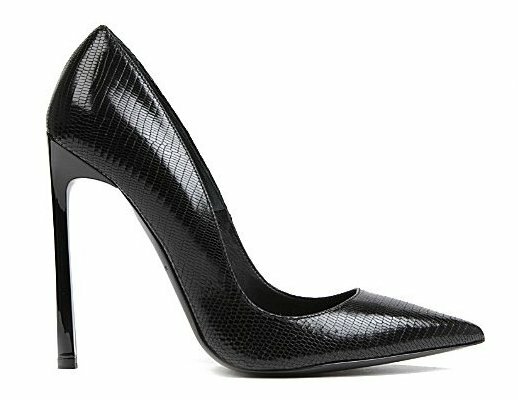 But I'd lose out on time in heels, and while it may be a chore to many, I actually enjoy trawling the winter sales looking for shoe bargains. 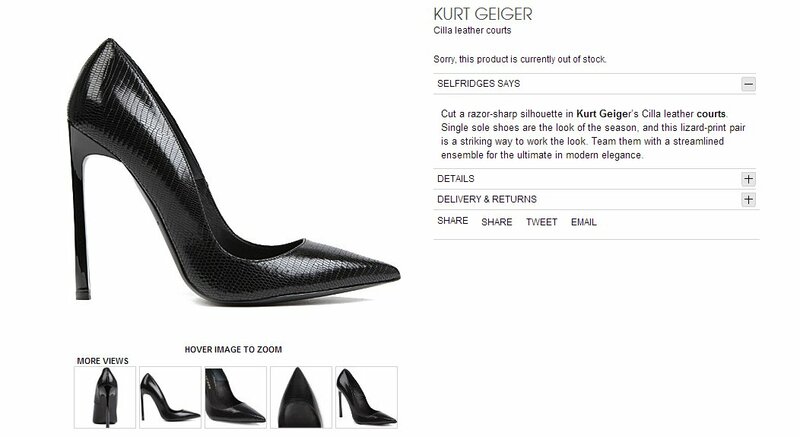 As reported above, I spied a pair of KG Cilla in Topshop at £75, during a late weekday evening 'returns' run. If I remember, 'flu' had me laid up the following weekend, so no immediate return for another browse and temptation session until around 8 days later. That's a long time during a London winter sale period. When I finally returned, the pair I saw, and any other residual stock at KG shops had gone. In truth it would be unlikely I would find myself wearing such a shoe outside, and if I did, it would have to be for a very short period on my feet given the absence of room in the toe box. But what a delicious fantasy to own a pair with the intention of wearing then out? I will be in London this Thursday, if anyone would like to meet up. I'm planning to go to Oxford street about 12 noon. I got some round toe Aldo stiletto court shoes in black, approximately 4". They are a little tight at the moment. Once back in my home town I went to Tesco as I was walking through the shoe section (short cut) I saw sale shoes. I had a look and found a pair of white pointed toe court shoes with a chunky heel. At £5 I decided to buy them. They lady working on the clothing section said she liked them and I had made a good choice, especially at the sale price. These are a good fit. I think these are the Aldo shoes. I have taken photos of both pairs on my iphone, but can't upload because the file size it too big, although I can upload them to the high heel place website. Forgotten I'd mentioned these ..... Some weeks later I found a pair languishing in a KG shop. Not quite £75, but close enough. I own them. The right shoe tries to cut two of my toes off while I have them on, and the heel is too high for me to walk in without 'warming up' in some other heels first, but they are beautiful. Expensive, and I'll never wear them. But they are so lovely to look at, I knew as soon as they arrived they weren't going back. While fishing out the money from my pocket, I had the boots -very obviously my shopping- resting on an empty bench in the ladies department when a nice looking assistant walked past. She looked at the boots, then me, and smiled. A minute or two later, me with cash readied and walking toward the till, she passed again while returning to her section. Another glimpse of my shoes, and this time her smile practically included a wink as she passed me. A very pleasant reaction. I gather that London's two Westfield shopping malls had a bumper Easter, with nearly 1m 'visitors' (some of whom, presumably, spent money there). The Shepherd's Bush site (one of Freddy's favourite emporia) is allegedly the largest shopping centre in Europe. Retailers usually measure their custom in terms of 'footfall' - which, taken literally, rather suggests an absence of anyone in heels. But I imagine that Westfield could be considered a 'high yield' investment.. Happy new tax year, everyone. As mentioned elsewhere, I was at W/F White City not long ago. The highlight (for W/F) of the new extension is John Lewis. A helpful assistant told me he had been apologising all day to people looking for stock they didn't have at the store. One of them, was me. IIRC there is no camera store at W/F and that (unusually) includes JL. Big/bigger/biggest it might be, but it's not much more than a glorified coffee shop if you can't buy stuff you want. When Primarni opens, footfall will increase I'm sure, as will takings at the centre. I doubt HoF or Debenhams will see much of that money though. HoF is hardly worth a visit, and neither is Debenhams. Both have better stores on Oxford Street, as does JL actually. The ONLY reason I visit W/F these days, is the covered mall, and I have access to free parking during the week. When the free parking ends, so will my visits. Due to the continuing increase with internet sales, many stores are choosing to thin-out store stock. Not so true of the stack 'em high sell 'em cheap brands like Primarni, and no surprise the stores with good value offerings are on the up. Primarni doesn't do internet selling ... Where is the lesson for the 'big' stores? Interesting, Freddy, that you refer to it as 'White City' whereas Westfield itself describes its location as 'Shepherds Bush'. Both are correct (in that WC is arguably a discrete area within SB) but, knowing the area well, I would tend towards the WC designation as being the more precise, i.e. the area around Wood Lane that is north of SB Green. However, the nearest station - immediately adjoining the site - is Shepherds Bush (Overground, WL Line). I agree that it has relatively little to offer - apart from some comfy chairs when a breather is needed. And it is inferior to other locations and/or the internet for most shopping. The parking charges are appalling and must be a deterrent - my two visits there were by public transport - how did you get to park free? how did you get to park free? Where you travelling by car to W/F from the North Circular, the closest 'town' ** is White City home of the BBC of course. SB is on the far side of W/F and given the s/hole status of S/B I wouldn't choose to travel to those stations anyway. Wood Lane would be my preference, and I've parked my car quite close to it in the past. Not a bad walk in heels. I was aware of your 'Blue Badge' access, but not sure why you implied that the parking concession at Westfield would be ending - Westfield action or loss of friends with badges? Shame for you if it does. Wikipedia may regard the shopping centre as being in White City but Westfield itself says it is in Shepherds Bush. White City (no longer so important for BBC TV since the majority of the TV centre was sold/redeveloped) is within SB and has long been recognised as a 'locality', but it ain't a 'town'. The nearest (and newest/smartest) station to the shops is Shepherds Bush (Overground) with a good service from Milton Keynes, Watford Junction, Willesden Junction etc and (from the more salubrious south), Clapham Junction, East Croydon etc. Wood Lane is only served by the Hammersmith & City/Circle Line local services. I have known Hammersmith/SB/WC well since 1960 and seen its decline and, more recently, rejuvenation (if you can call the WC development 'rejuvenation'). The improved transport links (especially on the long-neglected WL line) have been very welcome. My earliest memories (c1960) were of the rows of large houses (mostly between H and SB) that were turned into run-down tenements and offered with the universal caveat 'No coloureds, no Irish, no dogs' displayed on the street door. Despite that, many West Indians seen in and around SB; the women very often in colourful dresses and stilettos. In all respects, an eye-opener to many of us. And a schoolfriend who was keen on chemistry and lived in SB was delighted to find a pharmacy there that would not only sell him the ingredients for gunpowder but also in the right proportions! Fortunately not an eye-opener (or closer) for any of us! The scheme is trying to remove as many of these as it can. It's getting to the stage that if you have legs or a modified car, (for a wheelchair) you don't need a badge, so I may lose access next renewal. Me and Wiki prefer White City. Nothing else is of consequence. 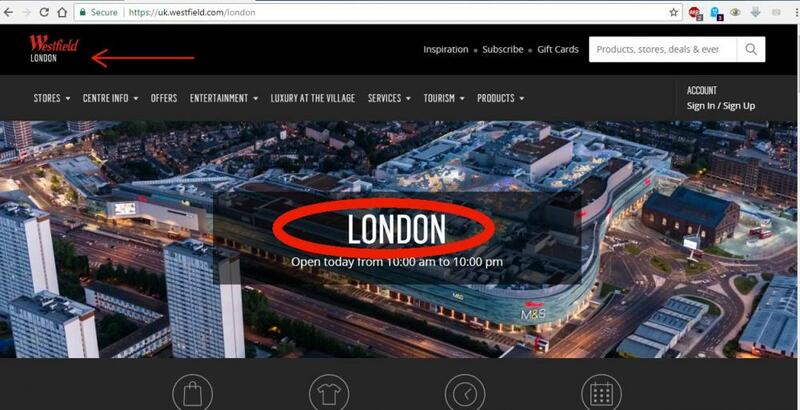 If W/F Stratford didn't exist, it would simply be "Westfield" as it was during 2008-2011. District/town, as opposed to village. (Which anything inside London is unlikely to be.) It's just semantics. Rather like the W/C vs S/B debate. The last "district" I go through is W/C, I never touch S/B proper as I always drive, even if arriving from the West End. (a.k.a. City of Westminster.) I have added a side note (that isn't actually on the side of anything) to my post to explain a little better though having to explain so much does suggest a lack of common sense in readers? Westfield 'West End' would get almost everyone understanding which of the two malls in the Greater London postal area is being referred to. "Greater London" in this instance given to mean most areas inside the North and South Circular roadways. It's very wearing, having to 'explain' and 'justify' so many comments. Is there a real need to 'challenge' every word I write? While I too am tempted to correct things like poor spelling (I sometimes do this anyway when quoting but don't otherwise mention it) the repeated "nagging" about silly/meaningless/unimportant differences make contributions seem a chore. Do you mean that the (national) Blue Badge scheme is being revamped, in terms of tighter control of issue/renewal and/or reduction in designated spaces? (My mother-in-law has a Blue Badge and there was no issue at last renewal.) I can understand tighter control (there is undoubtedly abuse) and of course parking of all types becomes more difficult as demand outstrips spaces. There was no direct challenge intended (re WC/SB etc) but a wish to establish your views. Others here might not have the same knowledge of London's geography or understand your departure from how Westfield describes itself. In any event, if you go back to my penultimate post, you will see that I was suggesting that WC would be the better location descriptor - despite the adjoining station being 'SB'. Either will do. At least two of the people I know who have had the benefit of a Blue Badge for many years, have been subjected to "walking tests" where an untrained (sub-contracted) person assesses the fitness of the applicant. Someone with MS who gets tested on a 'good day, might lose out, where a test on a 'bad' day would reveal the true extent of their disability. The walking test has been applied in these parts on every second application. You are right in that demand can in places outstrip availability. Thing is, what is "demand"? Referring back to Westfield London ( ) where I made a visit recently, of the 10 spaces in the area where I choose to park, at least 6 were taken by owners of exotic vehicles (£40k 4x4's for example) with no Badge displayed. Not only are B/B's considered "family benefits" by some cultural groups, but the facilities themselves aren't often policed by the owners of the space. I know of an ASDA car park, and a Sainsbury car park, where I could almost guarantee visits would find at least one car parked without a Badge. Owners of Mercs and BMW's seem to be the worst offenders. I have a personal dislike of those who park in B/B spaces without the correct means of parking on them. Were I able to agree a fee sharing arrangement with the respective management companies, I would take great joy in issuing tickets for infringements. Handicapped people have it bad enough, without having to fight for their few benefits.